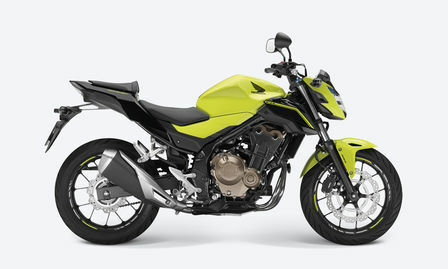 PCP Terms and Conditions: New retail CB500F orders before 31/07/19. Subject to model and colour availability. Offers applicable at participating dealers and are at the promoter's absolute discretion (excluding Channel Islands). Representative example based on 3 years 6.9% PCP. Excess mileage rate applies. Final payment includes £10 option to purchase fee. You do not have to pay the Final Payment if you return the bike at the end of the agreement and you have paid all other amounts due, the bike is in good condition and has been serviced in accordance with the Honda service book and the maximum annual mileage of 4,000 has not been exceeded. Excess mileage rate applies should this be exceeded. Indemnities may be required in certain circumstances. Finance is only available to persons aged 18 or over, subject to status. All figures are correct at time of publication but may be subject to change. Honda Franchise Dealers are credit brokers, not lenders. Credit provided by Honda Finance Europe Plc. Cain Road, Bracknell, Berkshire RG12 1HL. Honda Financial Services is a trading name of Honda Finance Europe Plc. a company registered at Companies House No 03289418. Honda Finance Europe plc is authorised and regulated by the Financial Conduct Authority, Financial Services Register number 312541. The 35kW A2 licence-friendly CB500F street bike received a hard-edged makeover for 2016 with a more stripped down, muscular look; other upgrades included a larger fuel tank, LED lighting, spring preload adjustable front forks, new lightweight exhaust and adjustable brake lever. Five vibrant paint options complement the aggressive angles. For 2017, the CB500F meets the stringent new EURO4 emissions regulations. While its 471cc DOHC engine - producing 35kW and returning 29.4km/litre - and steel diamond-tube frame remained unchanged, the CB500F emerged for 2016 with new aggressively-sculpted lines front to back. The styling showed off the machine’s mechanical forms; LED headlight and taillight gave high quality finishing touches. A larger 16.7 litre fuel tank extended range, and detail improvements such as hinged fuel cap, adjustable-reach brake lever and ‘wave’ style ignition key elevated the overall owning experience. The riding experience was improved with the addition of adjustable spring preload in the front forks, redesigned shift drum for smoother gear changes and new short exhaust muffler, with tuned internals, that emits a crisp howl in keeping with the engine’s engaging power delivery. For 2017, the CB500F now meets the stringent EURO4 requirements. The allowable limits for exhaust tailpipe pollutants such as carbon monoxide, hyrdrocarbons and nitrous oxide specified by EURO4 are approximately half of those for EURO3. The styling concept behind the CB500F’s angular minimalism is ‘Mechanical& Aggressive’ with the compact headlight cowl and seat unit – and downsized bodywork – creating a condensed trapezoid form focused around the engine and frame. Small but efficient the LED headlight features position lights located in the upper left and right side, creating an assertive front-on presence. A character line and duct are carved into the speedometer case, adding a sharper edged appeal. The small side panels are split into two parts, with the upper painted. The middle shrouds are also very compact – with angles interlocking with the fuel tank shape – and expose the steel frame and compact parallel twin engine with its premium bronze crank and cylinder case cover. Both rider and pillion footpeg hangers were reduced in size for 2016, with die-cast aluminium footpegs for the passenger adding a touch of class. The strikingly compact rear seat unit is finished with a clear-lensed rear LED light and sharply- designed steel fender mount. Detail upgrades for rider benefit included a hinged fuel cap and 5-step adjustable span brake lever. The ‘wave’ key gives a smooth, premium feel. Other genuine Honda Accessories for the CB500F include heated grips, carbon-look front mudguard, seat cowl, U-Lock, sports tail pack, rear hugger, tank pad and AC charging socket. The CB500F’s DOHC, 8-valve liquid-cooled parallel twin layout offers a great balance of physical size and flexible output. The ‘triangle’ proportion of crankshaft, main shaft and countershaft is very similar to that of Honda’s four-cylinder RR engines and much of the internal structure and engineering is taken directly from both the CBR600RR and CBR1000RR. PGM-FI fuel injection provides superb throttle response; the gas flow route from airbox to exhaust is as straight as possible and a plate in the airbox separates the airflow to each cylinder. Peak power of 35kW arrives at 8,500rpm, with 43Nm torque delivered at 7,000rpm. The engine acts as a stressed member, reinforcing the frame’s rigidity with four frame hangers on the cylinder head. Internally the cylinder head uses roller rocker arms; shim-type valve adjustment allows them to be light, for lower valve-spring load and reduced friction. A silent cam chain has the surface of its pins treated with Vanadium, reducing friction with increased protection against dust. Inlet valve diameter is 26.0mm with exhaust valve diameter of 21.5mm. Bore size of 67mm is identical to that of the CBR600RR. The piston shape is based upon those used in the CBR1000RR to reduce piston ‘noise’ at high rpm. Friction is reduced by the addition of striations on the piston skirt (a finish that increases surface area, introducing gaps in which oil can flow for better lubrication). As with the CBR600RR and CBR1000RR, an AB1 salt bath process, used after isonite nitriding, forms a protective oxidisation membrane. The crankcase uses centrifugally cast thin-walled sleeves, and the same bore interval as the CBR600RR makes them as compact and light as possible. Their internal design reduces the ‘pumping’ losses that can occur with a 180° phased firing order. Using the same internal relief structure as that of the CBR1000RR, the oil pump features improved aeration performance, with reduced friction; a deep sump reduces oil movement under hard cornering and braking. Oil capacity is 3.2 litres. A six-speed gearbox mirrors that of its RR cousins which uses the same gear change arm structure and link mechanism. In an update for 2016, the shift drum stopper spring load has been revised, along with the shape of the shift drum centre, for smoother, easier gear changing. The short exhaust muffler design uses two internal chambers, joined by a punched link pipe; and delivers a crisp exhaust note as rpm rises. The CB500F’s 35mm diameter steel diamond-tube mainframe is light and strong, with a tuned degree of yield that gives plenty of feedback to the rider as road surfaces change. The shape and position of the engine mounts, plus the frame’s rigidity balance, reduce vibration. Wheelbase is 1410mm and rake and trail are set at 25.5°/102mm giving nimble, yet reassuring steering. Mass centralisation, with the engine in very close proximity to the swingarm pivot point, delivers turning agility; optimum front/rear weight distribution ensures stability. Kerb weight is reduced to 190kg. Seat height is low at 785mm, making the CB500F very easy to manage and its sporty riding position will comfortably accommodate riders of varying heights thanks to a relatively high handlebar position. Overall dimensions are 2080mm x 790mm x 1060mm, with 160mm ground clearance. The fuel tank holds 16.7 litres including reserve, and combined with the engine’s excellent fuel economy gives a range of over 480km. The 41mm telescopic front fork, with 120mm stroke, delivers a compliant yet controlled ride and gives a great connection to the front tyre. For 2016 the CB500F gained spring preload adjustment and the fork legs were topped with Blue Alumite. Pro-Link monoshock rear suspension features 9-stage preload adjustment and works through a rigid box-section steel swingarm. Final drive is via 520 sealed chain.